Every year the students of our department have a T-shirt design competition. To participate in this competition one has to be enrolled as a major in the department or has taken a class in the department or has to be a staff member, tenured, tenure-track, associated or affiliated faculty of the department. There are some rules to the design: Not more than three colors because of the costs; the front of the T-shirt has to have the academic year and the department’s name on it; there has to be one design for the front and one for the back. The student who coordinates the competition and brings the order to the printer gets a $50 gift certificate and the winner of the competition will also get a $50 gift certificate. So far there were always donation to make these awards possible. To determine the winner all designs submitted by the deadline will be posted on a webpage for voting. Those who were eligible for submitting a design are the same crowd who votes on the best design. Everyone has one vote. There is an about a week or so time window for voting. Once the winning design is determined there is an about one week window to sign up for buying a T-shirt. Everyone can sign up to buy T-shirts. The more sign up, the cheaper the T-shirts become. Once the orders are in, the T-shirts get printed, distributed, and finally worn. It happened already several times that a student and their adviser wore the “departmental” T-shirt on the same day. After it happened to to me, I now only wear this T-shirt on Fridays. That day is safe because the students do formal Friday meaning they are wearing dresses or slacks, shirt and tie, while faculty and staff do casual Friday. In the photos, I wear last year’s winning design of the T-shirt competition. The design is pretty nerdy. On the front, it shows a schematic view of how the air masses move in a low pressure system. In the back it says “Got vertical motion?”. Despite I am not a big fan of college T-shirts – I usually wear them only to exercise or with a pair of PJ pants at night – I like to wear this T-shirt. 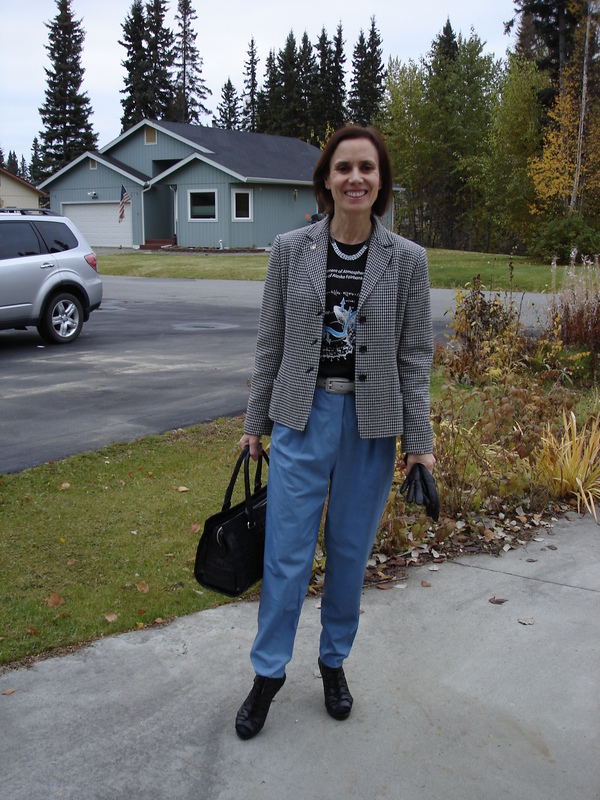 Its colors go so well with my hounds-tooth blazer and my sky blue slouchy leather pants. 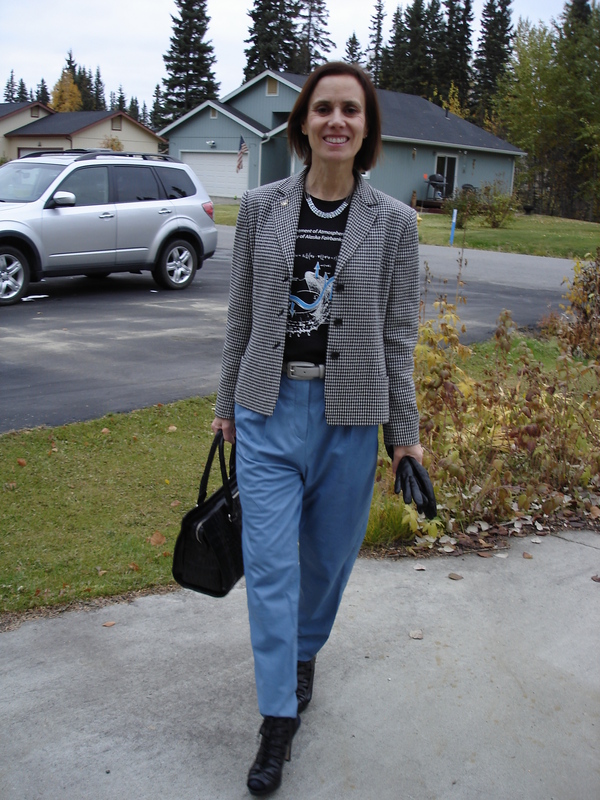 I added black socks, a grey belt, statement necklace, and lace sandals to complete this casual Friday look.